There was a recent article published by the Huffing Post that really had us thinking. The article was called, 25 Ways to Ask Your Kids 'So How Was School Today?' Without Asking Them 'So How Was School Today?'. It had some specific questions that parents could ask their children about their day that may provide more insightful answers than the typical, "good" response. As a school, we have a commitment to not only the children who attend, but also to our families. We believe that in order for a child reach their full potential, all of the adults in that child's life should be working together to meet the child's needs. This is why we are committed to keeping our parents informed about what is happening each week around the school through direct teacher communication, shared photos and curriculum information on Montessori Compass, and school-wide news on our website. We understand that children may not be able to fully articulate how school was today, or what the bead work they are doing now will prepare them for tomorrow, so we must work as a team, with open and frequent communication. Looking for fun interactive books to read with your children? Try the Pete The Cat series by Eric Litwin, with art by James Dean. One very popular title is, Pete The Cat, I Love my White Shoes; it will surely make you laugh as you read. This one even has a CD so you can sing along with your child. 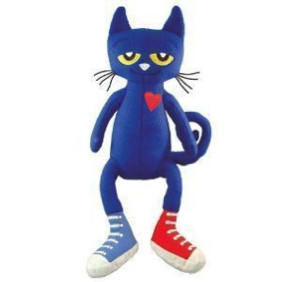 There is also a website www.petethecat.com dedicated to Pete The Cat and it will give you other favorites titles and interesting facts about the author, artist, and the books themselves. For the beginner reader there is an “I Can Read” set ideal for shared and guided reading with your child. Each September, as the new school year commences, we eagerly great new children who begin school for the first time. Although this new experience is exciting, taking this step towards greater independence can also be cause for stress and worry for both the child and parent. The American Montessori Society published an article this month with some great advice for helping to making a smooth transition into the first weeks of school. We hope that by providing the article here, it may give some advice to help ease the transition for our families. As you walk your child into school for the very first time, you may think, “How is this possible? I can’t believe she is old enough to go to school! It seems as if just yesterday” and your thoughts drift back to the day your newborn arrived. You remember cradling her, admiring the peach fuzz on her cheek, marveling at her long eyelashes, and taking in the sweet smell of her skin. She seemed so perfect and yet so helpless. You couldn’t imagine that one day this baby would not need you. Dropping your child off at school in the fall, whether it’s the first day of school ever, the first day at a new school, or the first day at a school the child has attended previously, can be incredibly emotional or even frightening to both you and your child. You may worry, “What if he cries all day?” “What if she misses me?” “Will the teachers love him?” However, your child needs your support and encouragement to learn to separate. When she took her first steps, you held out your arms, smiling and urging her to walk toward you. If he fell, you encouraged him to get back up and try again. The same is true with separating! Prepare yourself in advance, mentally and emotionally. There will be other occasions in which you will be “letting go” of your child—the first time she has a sleepover at a friend’s house, the first time he rides his bike somewhere without you, or the time she gets her driver ’s license—and it will be helpful to have a strategy to support this lifelong process. Recognize that this is a big step for you: Reassure yourself and be confident in your decision. Prepare your child as well. Attend any orientation events the school offers. Take your child to activities that familiarize him with the school or teachers. When your child is new to any environment, it can take time to become comfortable. Be upbeat and positive when talking to her about school. Young children are very intuitive and easily pick up on your worries or concerns, even if you are not voicing them. Come up with a consistent goodbye routine that you can follow every day, such as a hug, a kiss, and “Have a good day at school. I will be back to get you after lunch (or nap, etc. ).” This gives your child something specific to look forward to. “I know Mommy (or Daddy) always comes back after I eat lunch.” She can take comfort in the routine of the day, knowing when you will return. When parent and teacher partner together to help a child separate, it often only takes a few days for him to begin walking in confidently. If it takes longer, contact your child’s teacher to talk about how to make the separation more comfortable for everyone. The first day of school is just the beginning of your child’s journey toward becoming an independent, confident, and capable adult. Just think—one day you will be taking him to college! MELODY PATTON, MBA, has taught Toddler and Early Childhood classes at Children’s Garden Montessori School in Denver, CO, for 10 years. She is also an instructor at the Montessori Education Center of the Rockies in Boulder, CO. She is AMS-credentialed (Infant & Toddler, Early Childhood). Contact her at mapatton@att.net.